Autumn is in full swing and Halloween is just around the corner! I’ve been busy on the allotment, harvesting lots of mini pumpkins and squashes that inspired my latest design! 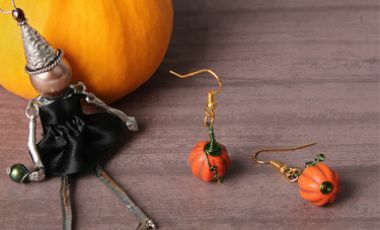 This cute pair of pumpkin earrings is perfect for Halloween outfits or if you’re an avid allotment gardener like me! In this mini-make you’ll learn how to make a wrapped bead cap and coiled wire to make the pumpkin stalk and the vine. You’ll have a whole range of howlite pumpkin beads on your strand to make lots of funky coloured designs. You can find the pumpkin beads at the Halloween Shop where you can find more treats (no tricks – honest!) to get creative this Halloween. Cut a length of 20cm wire or 23cm for extra long curly vines! Grab the very tip of the wire with your round nose pliers and twist to make the smallest loop possible. Use your flat nose pliers to hold the loop. To make a spiral, continue to hold the wire with the flat nose pliers and use your fingers to encourage the wire to sit next to the previous loop. You may need to adapt the position of your pliers as you work your way around the circle. Go around the original loop 2 or 3 times to make a flat spiral. Use your pliers to move the remaining wire into the middle of the spiral to make a post. Insert the wire through a pumpkin bead, leave approx. 1cm before bending the wire over your round nose pliers. Wrap the wire back across the centre wire to make a loop. For a video on how to do this, follow our How To Wrap a Pin tutorial. Hold the entire loop with your flat nose pliers and continue to wrap the wire. When you reach the beads, continue to spiral the wire so that it makes a small cap over the top of the bead. When you have about 3cm remaining, use your round nose pliers to coil the end of the wire. You can keep your coil tight by only using the tip of the pliers. After you have finished your coil, carefully pull and tweak the shape a little. I manipulated mine to follow the curve of the pumpkin bead but this bit if up to you! Open a jumpring and thread it through the loop of the earwire. Then close the jumpring onto the wrapped loop of your pumpkin bead. Repeat these steps to make the second earring to complete your pair. What do you think? I love them! Share your Halloween designs with us on our Facebook page and Instagram!